Update: 4th Nov Thanks to Annie for the heads up on this photo of Terry O’Quinn on the set. Ryan’s report here. Thanks to DarkUFO reader Lostforeever we have a few more and this report. I’m attaching some shots that I managed to snag from the same day as the fan from Ryan’s blog (Monday Nov 2). They had been there all day, but the rain was affecting their shooting schedule. I actually went right into Sawyer’s tent where Ben had previously been digging up something or burying something and it was covered with a fatigue looking tarp. If you look at the Ben-Ilana with gun pic, I’m in the background! How cool is that. Everything the fan said is correct, the only thing I would add is that there were 8 graves near Eko’s church..don’t know what that was, but they could be screwing with us! The crew were quite accommodating, but we stuck it out through the rain so they knew we were die-hard. I saw Miles, Frank, Ben, Ilana and Sun…but only Frank, Ben and Ilana actually shooting. As we were leaving, it looked like Sun had a scene coming up. Once again our good friend Ryan in Hawaii has posted a new set report and it seems like a continuation of the recent filming yesterday. 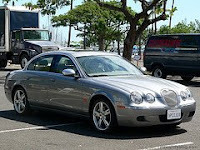 Today’s report confirms that Ben along with the Oceanic 6 (minus Hurley) are all meeting at the Long Beach Harbor Club. Long Beach is one of the largest ports here in Los Angeles and it seems like maybe the O6 might be making plans to head back to the island!? 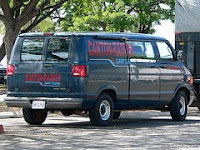 Spotted once again are the vehicles of the Losties including the blue carpet cleaning van with the Cantor-Rainier logo (anagram). Ryan was guessing that the filming was still for Episode 5×04 but the key might be that Hurley was NOT a part of the whole filming. So what do you all think is happening!? Are the Losties trying to head back to the island!? Where is Hurley!? Still in jail and would they leave him behind!? 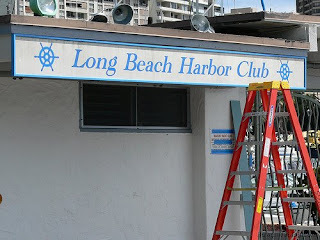 The Waikiki Yacht Club was transformed into the “Long Beach Harbor Club” for evening shoots last night and tonight. Cranes and production trucks were parked nearby, as well as three notable vehicles: the blue Canton-Rainier Carpet Cleaning van, Kate’s silver Volvo, and a silver Jaguar S-Class. My friend Doug, who knows cars better than I do, says it looks like the 2008 model. A yacht club member who was fortunately an avid fan said last night’s shoot involved Evangeline Lilly, Yunjin Kim, and a young boy playing Aaron. She said she was back tonight because the roster would be even larger. In addition to Kate and Sun, Sayid (Naveen Andrews), Ben (Michael Emerson) and Jack (Matthew Fox) were due on set. Thanks to Ryan for this latest filming report. The woman does indeed look like Sun, and the scene does seem to fit in with the overall “rounding up the Oceanic 6″ theme of the past several location shoots. But it’s interesting that they’re connecting with Desmond, who we last saw (filming wise) in the Philippines. Sacred Hearts and its Romanesque architecture could be standing in for any number of far-flung locations, but I’d guess not Southeast Asia. Thanks to Ryan for his latest filming report from the island. This morning, “LOST” was spotted at Hawaii Medical Center East on Liliha St., otherwise known as St. Sebastian Hospital. The scene took place in the emergency room, and thus beyond prying eyes. But a group of nurses were a titter, having spotted Jack (Matthew Fox), Sayid (Naveen Andrews) and “his girlfriend” — presumably Nadia (Andrea Gabriel). As we’re beginning to see, even in a universe where Oceanic Flight 815 arrives safely in Los Angeles, our friends are inexplicably crossing paths. And this afternoon, visiting fan “Daisy from Hazzard County” was among several visitors (including a group on a “LOST” tour) who happened upon a “LOST” shoot at Papailoa Beach (a.k.a. Police Beach), the main beach camp of several seasons past. Rain bursts made for a tricky shoot, but the crew persevered. In the scene were Ben (Michael Emerson), Frank (Jeff Fahey), Ilana (Zuleikha Robinson), Miles (Ken Leung), and Sun (Yunjin Kim). In one scene, Frank was gathering wood and working in the sand, and in another, he was toting a gun. Then, it was Ben’s turns to dig around in the sand. Finally, Ilana had Ben at gunpoint, and marched him down the beach.